Custom Framed I Believe in Santa Claus Print - Carmichael Inc.
HOW TO ENTER: The “I Believe in Santa Claus” framed print Contest brought to you by Carmichael’s Picture Framing (the “Contest”) starts November 9, 2017 at 8:00AM EST and ends on November 14, 2017 at 8:00AM EST (“Entry Period”). There is only one (1) way to enter the Contest. Enter through Facebook – You must have a Facebook account and internet access to enter the Contest through Facebook. You can sign up for a Facebook account for free at www.facebook.com. To enter the Contest through Facebook, sign in to your Facebook account and visit the Carmichael’s Picture Framing Facebook page at www.facebook.com//PictureFramingShop/. 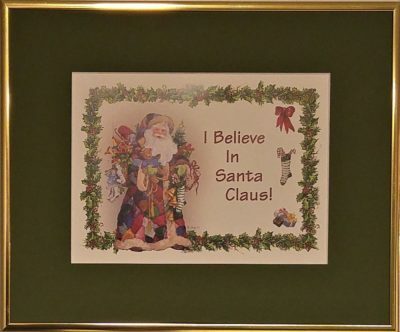 “Like” or make a “Comment” on the post containing a picture of the “I Believe in Santa Claus” custom framed holiday print . Limit one (1) entry per person per post. ELIGIBILITY:The Contest is open to all legal residents of the United States ages 18 years and over as of the date of entry, unless prohibited in the state. Employees, officers, directors, agents, and representatives of Carmichael’s Picture Framing (“Sponsor”), and their respective parents, affiliates, subsidiaries, wholesalers, retailers, distributers, advertising and promotion agencies, and their immediate family members (mother, father, sister, brother, husband, wife, daughter, son, step-father, step-mother, step-daughter, step-son, step-brother, step-sister, half-brother, half-sister) and/or those living in the same household of each are not eligible. All federal, state and local laws and regulations apply. Void where prohibited by law. SELECTION OF WINNER:Sponsor shall select the winner from among the eligible entries received during that Entry Period. Sponsor may take fan feedback into account in selecting the winning Caption, but shall select the winner in its sole discretion. All decisions of Sponsor are final. Sponsor will announce the winner on the Carmichael’s Picture Framing Facebook page. For the name of the Winner, refer back to the original picture containing “I believe in Santa Claus”. PRIZES:Winners will receive a custom framed holiday print – “I Believe In Santa Claus” by artist Barbara Mock (10” x 12” frame dimensions). Sponsor reserves the right to substitute the Prize with another of equal value should any unforeseen circumstances occur. All state, federal, and local taxes or other expenses not specified herein are the sole responsibility of the Winner. No Prize substitutions or cash redemption will be made except in Sponsor’s sole discretion. BY SUBMITTING AN ENTRY, ENTRANT REPRESENTS AND WARRANTS THAT HE OR SHE OWNS AND/OR HAS THE AUTHORITY TO RELEASE THE CLAIMS STATED HEREIN. FURTHER, BY SUBMITTING AN ENTRY OR ACCEPTING THE PRIZE, ALL ENTRANTS AND PRIZE WINNERS EXPRESSLY AGREE TO AT ALL TIMES DEFEND, HOLD HARMLESS, AND INDEMNIFY THE RELEASED PARTIES FROM AND AGAINST ALL CLAIMS OF ANY KIND OR NATURE WHATSOEVER (INCLUDING REASONABLE ATTORNEYS’ FEES AND DISBURSEMENTS) ARISING OUT OF OR IN ANY WAY RELATED TO THE CONTEST; THESE OFFICIAL RULES; ENTRANT’S ENTRY; THE NEGLIGENCE OF ANY OF THE RELEASED PARTIES; THE ACCEPTANCE, POSSESSION, MISUSE OR USE OF THE PRIZE; AND ANY PARTICIPATION IN THE CONTEST. THE RELEASED PARTIES ARE NOT RESPONSIBLE FOR ANY ENTRIES OR PRIZE NOTIFICATION EMAILS THAT ARE LOST, STOLEN, MISDIRECTED, GARBLED, DELAYED BY COMPUTER TRANSMISSION OR DAMAGED. CARMICHAEL’S PICTURE FRAMING WILL HAVE NO LIABILITY OR RESPONSIBILITY FOR ANY CLAIM ARISING IN CONNECTION WITH PARTICIPATION IN THIS CONTEST OR ANY PRIZE AWARDED. FACEBOOK HAS NOT OFFERED OR SPONSORED THIS CONTEST IN ANY WAY. PUBLICITY RELEASE:By participating in the Contest, each entrant irrevocably grants the Released Parties the right to use each such entrant’s name, photograph, image, video, biographical information, and Caption in any and all media for any purpose, including, without limitation, advertising and promotional purposes and each entrant hereby releases the Released Parties from any liability with respect thereto, except where prohibited. By entering this Contest, each entrant grants Sponsor the right to utilize the entrant’s contact information provided by entrant in their Facebook account to contact entrant for any reason via Facebook, phone, email, and/or mail. “Liking” or making a “Comment” constitutes assent to these written terms. ADDITIONAL DISCLAIMERS:The Released Parties are not responsible and/or liable for: any lost, late, incomplete, illegible, mutilated, misdirected, or postage-due mail; technical or mechanical malfunctions; or errors in these Official Rules or in any Contest-related advertisements or other materials, whether caused by the Released Parties, the entrant, or any of the equipment associated with or utilized in this Contest or by any human error which may occur in the processing of the entries in this Contest and which may limit a participant’s ability to participate in this Contest. Sponsor reserves the right, in its sole discretion, to void entries of any entrants who Sponsor believes have attempted to tamper with or impair the administration, security, fairness or proper play of this Contest. GOVERNING LAW:ALL ISSUES AND QUESTIONS CONCERNING THE CONSTRUCTION, VALIDITY, INTERPRETATION AND ENFORCEABILITY OF THESE OFFICIAL RULES OR THE RIGHTS AND OBLIGATIONS OF THE ENTRANTS, SPONSOR OR RELEASED PARTIES IN CONNECTION WITH THE CONTEST SHALL BE GOVERNED BY AND CONSTRUED IN ACCORDANCE WITH THE LAWS OF THE STATE OF PENNSYLVANIA WITHOUT GIVING EFFECT TO ANY CHOICE OF LAW OR CONFLICT OF LAW RULES OR PROVISIONS THAT WOULD CAUSE THE APPLICATION OF ANY OTHER STATE’S LAWS. FACEBOOK:The Contest is in no way sponsored, endorsed or administered by or associated with Facebook, Twitter, and/or Instagram. You understand that you are providing your information to Sponsor and not Facebook, Twitter, and/or Instagram. Do not direct any questions, comments, or complaints to Facebook, Twitter, and/or Instagram. SPONSOR:Carmichael, Inc. dba Carmichael’s Picture Framing, 301 Evergreen Rd, Edinburg, PA 16116.